the game from the ball's point of view. Imagine flying through the air at 50 miles an hour, swiftly dipping towards the ground, seeing the strained and determined expression on the wide receiver's face. "Wouldn't it be cool if we could watch sports from the ball's point of view?" asked Kris Kitani, a post-doctoral fellow at the Carnegie Mellon Robotics Institute. Kitani and his colleagues at Carnegie Mellon and at the University of Electro-Communications in Tokyo, Japan are working on just that. "It took a couple of tries — shredded balls and broken cameras — to find a good way to put the camera inside of the ball," said Kitani, "in the end, we cut a hole in the side of the ball and pushed the camera in." By embedding a camera inside of a football, the scientists are exploring a new area of research that Kitani calls Digital Sports. Using cameras and other sensor-detector technology, Kitani is interested in how technology can aid in analyzing athlete training, augment the spectator experience of the sport, and even create new sports. Kitani's specialty is computer vision, developing hardware and software that allows computers to recognize aspects of an image like face recognition or robotics that autonomously navigate a room. 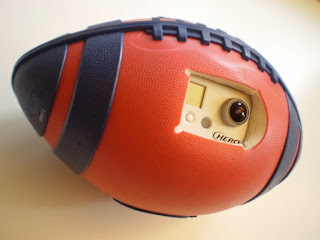 BallCam, as the camera laden football is called, records image frames as the football is thrown. A computer algorithm then sorts through these frame, recognizes and tosses out the frames where the ball is facing the sky. The remaining field-facing frames are organized and lined up to create horizontal panoramas of the field as the ball moves down field towards its target. In the video, the team demonstrates how the tilt-a-whirl like video of football flight can be reconstructed for a "ball's-eye view" of the pass. Kitani's other research includes developing an experimental mobile app that translates images to sound for the blind. "I really think that the advances in hardware and software makes it a ripe time to explore the integration of technology and sports — Digital Sports," he said. This week on the PhysicsCentral Podcast is the story of John McNeile Hunter, the founder and long time head of the physicss department at Virginia State College. He was the third African American to receive a PhD in physics. However there have been many more. Edward Bouchet was the first African American to receive a PhD from a university in the United States. He received his doctorate in 1876 from Yale after studying optics, but had trouble finding a teaching position afterwards because of his race. He took a position teaching physics and chemistry at the Institute of Colored Youth in Pennsylvania for 26 years, then moved around to several different colleges and high schools at the end of his career. Nanotech material reflects light to display pictures without chemicals or electricity. As a peacock moves around, its tail colors appear to change. That's because its iridescent feathers reflect different colors, or wavelengths, of light, at different angles. The gloriously colored, iridescent feathers of the male peacock aren't what they seem on the surface. They look that way largely because the feathers contain nanometer-scale protein structures that break up incoming light waves, recombine and reflect them as rich, vibrant colors. Marriage proposals can be romantic, cliche, meaningful, or embarrassing. But have you heard of a peer-reviewed proposal? Recently, one creative physicist named Brendan concocted a proposal that would make his thesis adviser proud. 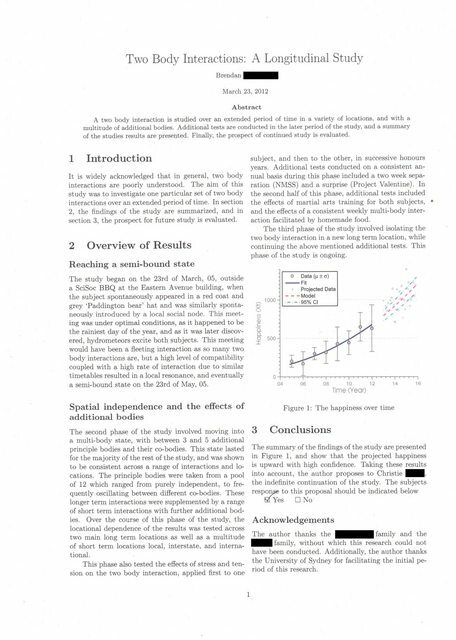 He wrote a "research paper," concerning an ongoing "two-body interaction" between himself and his long-term physicist girlfriend, Christie. Brendan submitted his paper to Christie, and she had the choice to continue their ongoing personal research. The summary of the findings...show that the projected happiness is upward with high confidence. Taking these results into account, the author proposes to Christie the indefinite continuation of the study. The subject's response should be indicated below. According to a photo submitted to reddit, it looks like Christie has chosen further study with Brendan. Brendan's physics-inspired marriage proposal to his girlfriend, Christie. Click for a larger image. 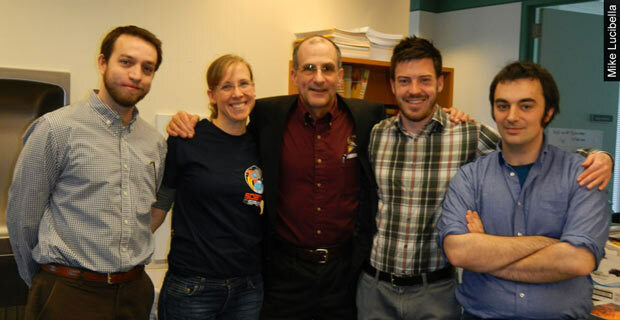 Earlier this week, astronaut Don Pettit (of Science off the Sphere fame) stopped by the Physics Central offices in College Park, MD. We were fortunate enough to ask Don a few questions about living in space, immigrating to Mars, and riding aboard a Soyuz spacecraft. Pettit's enthusiasm for science, space, and exploration is truly inspiring. Head on over to Physics Central for the full interview. Scientists use multiple tests to prove the region where gems were mined. Each precious stone carries within it clues that scientists can examine to prove the gem's original location. The diamonds, emeralds, rubies and sapphires in a jeweler's cases come in many colors, cuts and settings, but where a gem was mined is not apparent from its physical appearance. 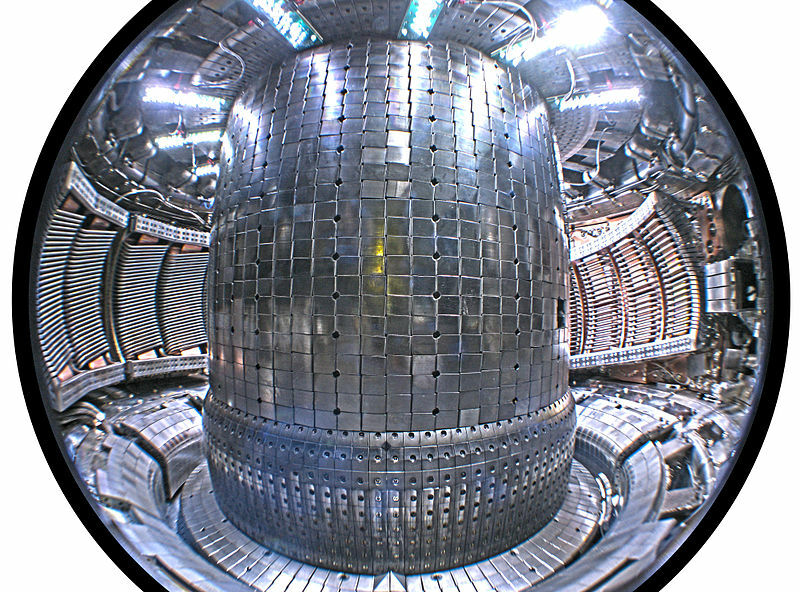 While I was in Boston for the AAAS conference, I got the chance to tour MIT's Plasma Science and Fusion Center. Though there were amazing science presentations going on at the convention center that I hated to miss, the chance to see the latest in plasma research was too good to pass up. A plasma is essentially a really energized gas, and it's often called the fourth stage of matter. The particles in a plasma have so much energy that electrons can't bind with electrons, which gives these naked nuclei a net charge. Positive protons aren't canceled out by the negative charge of electrons, which lets scientists use magnetic fields to manipulate plasma taking all kind of different shapes. The teams at MIT's lab are working on a number of different experiments looking at ways to understand and harness the power of plasma. This week's podcast comes from the AAAS Meeting in Boston, where researchers were talking about what they've learned from mussels, the tiny mollusks that bind to hard surfaces along ocean coastlines. Mussels position themselves right in the path of crashing ocean waves, which means they have to withstand thousands of pounds of pressure if they want to stay attached. If I had to guess (before this meeting) how mussels accomplish this feat of strength, I might assume they used some sort of biological cement: something rigid and thick. 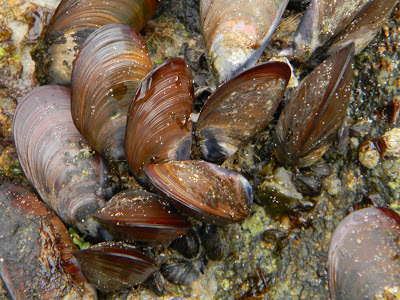 In actuality, mussels use something called a byssal thread, which is not much thicker than a human hair. Researcher Emily Carrington talked a bit about her work studying these threads in the wild. Not only do these tiny threads somehow withstand thousands of pounds of force, but they attach to surfaces in the presence of water. That's something that most human-made adhesives can't do (try using a tube of epoxy from a hardware store to bind something in an aquarium). For the last 40 years, researchers have tried to understand how the mussels accomplish this. One of the lead scientists in the field is Herbert Waite, who talked about how mussels use a chemical called DOPA to expel the water from underneath the byssal thread. Researcher Philip Messersmith and his group at Northwestern University are using a similar chemical structure to make medical adhesives that could be used in surgery and to heal internal tissue tears. Marcus Textor used the same DOPA binding mechanism to improve the design of nanoparticles, which can be used to deliver drugs to specific locations in the body. Listen to the podcast (on our website or on iTunes) to learn more. And here are a few additional stories about this work: in ScienceNow and CTV News. Deep in space, NASA's Fermi Gamma-ray Space Telescope has collected evidence that the massive explosion of stars long ago is responsible for the cosmic rays that bombard the surface of the Earth. Cosmic rays are high-energy charged particles that zip through the universe. About 90 percent of cosmic rays are protons, the rest being electron and atomic nuclei — all shooting through the galaxy near the speed of light. Astronomers could one day create rough maps of far-away planets using information taken from starlight reflection, determining the balance of oceans, lands and overhanging clouds. Early Friday morning, a streaking meteor illuminated the sky over Chelyabinsk, Russia. Seconds later, meteorite debris pummeled the city, injuring over 900 people. A shcokwave from the meteor's higher altitude explosions also cracked as it reached the ground and shattered glass windows. Below are a few videos of the incident as compiled by redditors "Therecanonlybetwo" and "hattmarington," respectively. The first video shows the meteor streaking across the sky from the view of a dashcam. The second video captured the booming shockwave's arrival on ground level and the subsequent damage. The world's longest-running scientific experiment is about to drop into the headlines. 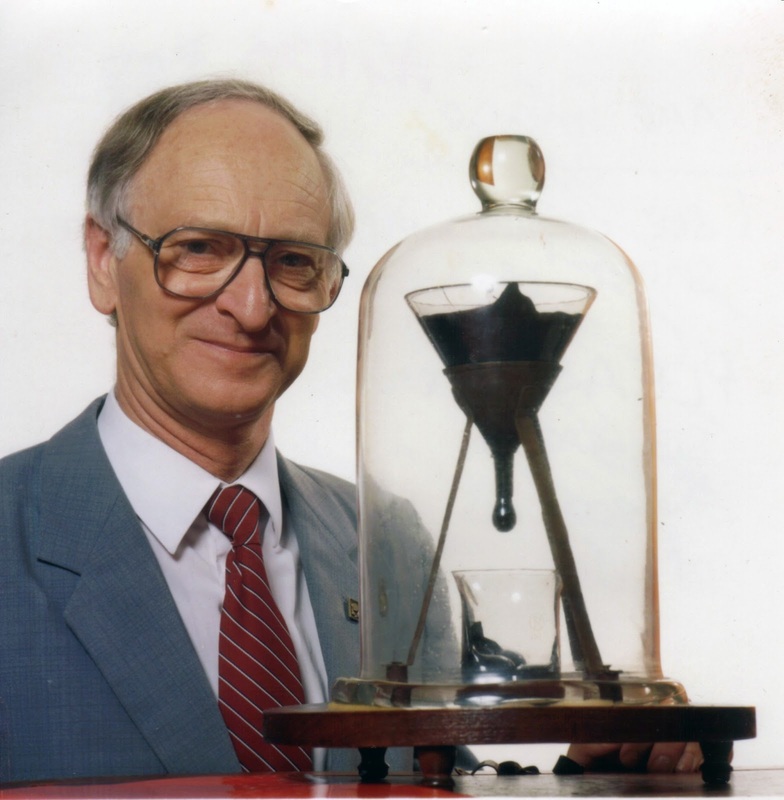 For over 80 years, two physicists at the University of Queensland have been standing guard over the Pitch Drop Experiment. Now, the decade-awaited moment of truth is bearing down: a drop is about to fall. In 1927, the first physics professor at the University of Queensland, Thomas Parnell, sought to demonstrate that some materials exhibit seemingly contradictory properties. Once used to seal the bottom of boats, tar pitch feels solid at room temperature and shatters like glass under a hammer blow. But, as Parnell has undeniably demonstrated, pitch is actually a very, very viscous fluid. So one day, Parnell placed a block of tar pitch in a sealed funnel. Three years later, the pitch had settled into the bottom of the funnel and in 1930 the bottom of the funnel stem was cut. The first drop fell in December, 1938. Here is the link to the live video feed. If you're lucky, you may see what no one has seen before—no one has ever seen the drop fall. John Mainstone, a physics professor at the University of Queensland and the experiment's current custodian, missed the last two drops by pure bad luck. Awaiting the eighth drip from a business trip, Mainstone secured a video surveillance system to trail the elusive drop. Alas, the video feed failed precisely during the fall of the eighth pitch-drop. Listen to John Mainstone tell the story of the missed adventure on last week's Radio Lab. While art historians obviously benefitted from this research, Rose says the study provided valuable information for him as well. 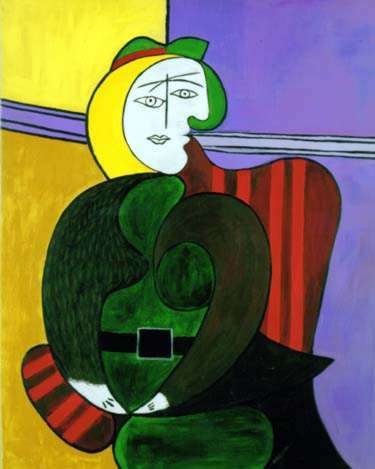 The key ingredient in both house paint and artists paint at that time, was zinc oxide: a material that has properties similar to silicon, making it a candidate for use in various electronic devices. To hear more, check out this week's podcast. Hopefully many of you have been following our Science Off The Sphere series of videos on PhysicsCentral. If you have, you know Don Pettit is a pretty cool guy. He does really cool demos and even offers dating advice from time to time. This Friday, Don will be interviewed on NASA TV and he wants to answer some questions from you. If you have a question you've always wanted to ask Don, anything from where did you learn to play the didgeridoo to where did you get cornstarch in space, put your question in the comments section below. If you'd rather let us know your question directly, send an email through our website. There's a British invasion afoot today. The BBC science show "Bang Goes the Theory" premieres tonight on BBC America. So how does this show distinguish itself from the abundance of other educational science shows on TV today? Part of the appeal stems from a selection of awesome experiments. In the first episode, for instance, the show's presenters experimented with an enormous vortex cannon and a fire tornado generator (something we've done in the past). But there's more to this show than just cool experiments; the team also interviews leaders in science and technology for short magazine-style segments. The show seems like a cross between 60 minutes and Mythbusters, sprinkled with British accents. This year's awards showcase the interplay between art and science. The goal of every movie is for the audience to suspend its collective disbelief and become immersed in the world created on screen. With special effects breakthroughs continuing to raise the bar for movie audiences, the technical folks behind the scenes are convening on Saturday to celebrate the science and engineering advances in moviemaking. 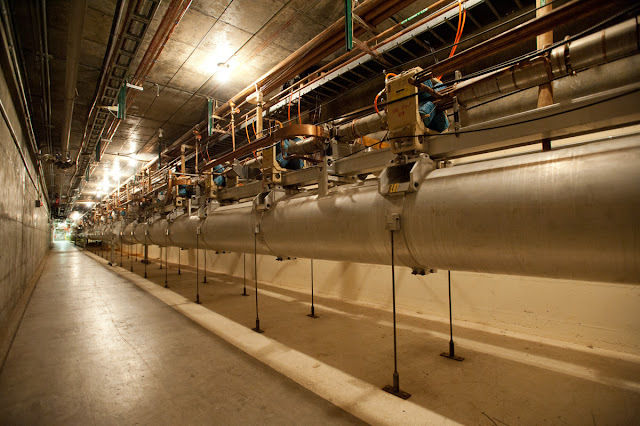 Buried deep underground lies one of the longest buildings in the world: the SLAC linear particle accelerator – colloquially, the "linac". Most who pass by don't get the chance to see the 2-mile netherworld through which electrons fly at nearly the speed of light and emit X-rays that enable scientists to take pictures of the smallest atomic structures, uncover the chemical basis of photosynthesis, and probe fundamental properties of matter at the center of stars. The excitement of the place rubbed off on Greg Stewart. Faced with a childhood's supply of Legos, the SLAC graphic designer got to work. While maintaining an appropriate – shall we say – Lego minimalism, the Lego accelerator has a surprising level of detail, including separating the particle accelerator (little tube) from the laser light pipe (big tube) that keeps the particle beam aligned. QT: How did you come up with the idea? And how long did take you to build it? GS: I came up with the idea after reacquiring a box full of old Legos from my childhood. I was thinking about what to build, and the SLAC linac popped into my head! It only took two evenings at home to put it together. QT: How did you get interested in SLAC in the first place? GS: At first my interest was in the long building I would drive over on interstate 280...I knew they accelerated particles, but that was about it. Then a friend sent me the job posting at SLAC and it sounded like an amazing opportunity! QT: Where did you find so many grey legos?? GS: I only wish I had more grey Legos! In fact the Lego model is only one section of the linac, then multiplied numerous times in Photoshop. I had to be a little creative and use yellow ones in some places, but I like how it breaks up the monotony of the grey. QT: Why are the lego people wearing very nice helmets? Are any of the lego people women? GS: Safety is essential, even for little Lego scientists! Those helmet styles aren’t standard SLAC PPE (personal protective equipment), but they were what I had lying around from old Lego space sets. I have no idea if the yellow Lego people are gender specific, so it's possible! QT: And, more seriously, How is it to work as a graphic designer for SLAC -- what other kinds of projects do you work on? GS: I love what I do at SLAC! Having the opportunity to visualize science and translate it into something anyone can understand is a challenge, but the rewards are incredible. On any given day I can be crafting scientific illustrations, animating in 3D, or designing posters. I'm a jack of all trades, and I guess I can now add Lego to my toolbox! Add that to the collection of Lego representations of cool and huge science. 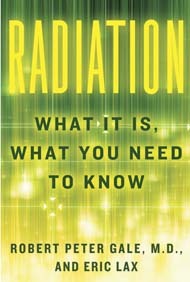 This week on the podcast I talk with Robert Gale and Eric Lax, the authors of the new book "Radiation: What it is, what you need to know." Most people associate radiation with it's harmful effects and the mistakes made by people entrusted to manage it. After the Fukushima nuclear accident in 2011, Gale went to Japan to treat patients who had received high doses of radiation (although no one there died from radiation poisoning). Gale's first experience like this was with victims of the Chernobyl nuclear disaster in 1986. Following these types of events, Gale and his colleagues would watch as scores of bad information spread, and people would panic. What they needed was not a response to an emergency, but an effort to educate people before a disaster happened. But of course, most questions about radiation don't have simple yes or no answers. For example, scientists know that a certain dose of radiation will give a person radiation poisoning; but they cannot say for sure if someone exposed to a lower dose of radiation will develop cancer, because those effects are determined greatly by chance. Furthermore, while an unintentional dose of radiation can kill a person, when used in the right way radiation can also cure diseases. Lax and Gale argue that radiation is not inherently bad: like any technology, the outcome depends entirely on how we use it. Listen to this week's podcast to hear more. Don't try this in the tub. Scientists applied an electric field across a soap bubble and discovered that the electric field could draw fluid up through the soapy film – against gravity. The researchers also found that the strength of the electric field controls the thickness of the soap film and changes the rate of fluid flow up the bubble. The results were published February 1, 2013 in the journal Physical Review Letters. Turn Your Phone Into a Spectrometer — For Free! Our world is filled with different light sources: fluorescent office lights, sodium street lamps, and bright neon lights to name a few. 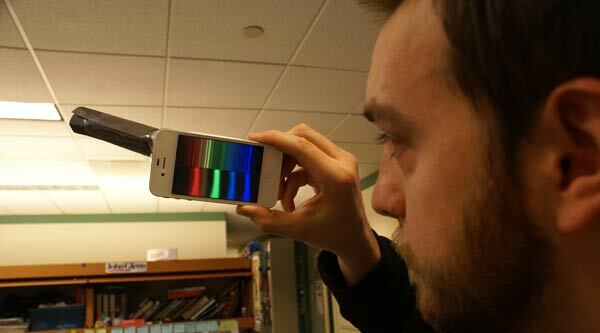 Now you can see all of the emission spectra of these light sources with our new iPhone app: SpectraSnapp. Did I mention that it's free? Remember those flame tests from high school chemistry class? You would burn a specific element — such as copper or sodium — and each element would burn with a different color. For instance, sodium burns with an intense yellow flame while lithium will burn red. These characteristic colors emerge because every element or chemical compound has its own emission spectrum. When an atom's electrons are excited, it will emit photons of specific wavelengths. Atoms emit photons of various energies when electrons are excited from one energy level to another. The magnitude of the energy jump for the electrons determines the energy — and subsequent color — of the emitted photons. 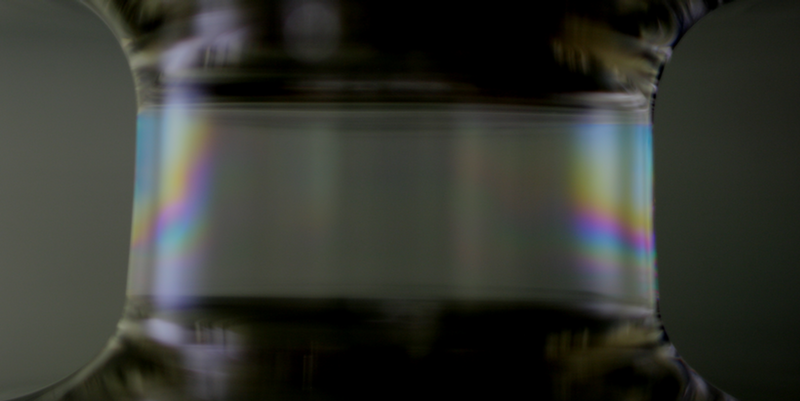 Using an instrument known as a spectrometer, physicists can see the unique emission lines for an element or compound. With SpectraSnapp, now you can too! APS Outreach Specialist James Roche shows off SpectraSnapp. Scientists in Australia believe they've identified a quasar in the process of lighting up, for the very first time. 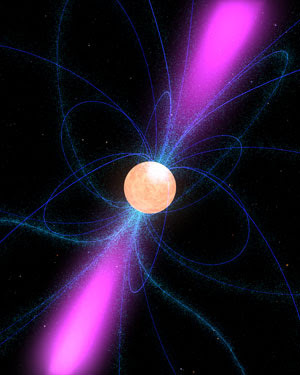 An artist's impression of an active quasar. This discovery could help scientists answer lingering questions about how these exceptionally bright celestial bodies form, and how they helped the ancient universe shape today's galaxies.